It's pretty well known that America's favorite lunch food is the sandwich and one of America's favorite chefs is Emeril Lagasse. So if you are serious about sandwiches you will love Emeril's new book "Kicked up Sandwiches"
Included in this book is a collection of over 100 traditional and non traditional sandwich recipes (see the sample recipe below) perfect for every skill level. Whether it's a savory breakfast sandwich, an on-the-go lunch, or even a yummy dessert, there is something for every meal. So why am I telling you this? Me and 20 fellow food bloggers (see the complete list here) will be spending the next 3 weeks cooking our way through this book and sharing with you our experiences. By following us you will get a sneak peek into the world of kicked-up delicious sandwiches. 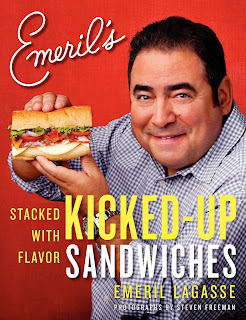 Want a chance to win your very own copy of Emeril's Kicked Up Sandwiches? Here's all you have to do. Stop by my blog between now and Oct 15th. Leave a comment on any or all of the Emeril posts (there will be 2 posts per week) Let me know what you think of these sandwiches; which ones you'd want to try and you will be entered. The winner will be announced on Oct. 16th...the day the book is being released. Follow Morrow Cookbooks on Facebook and leave a comment here letting me know. I will periodically post more ways to enter so be sure to read all the upcoming posts. 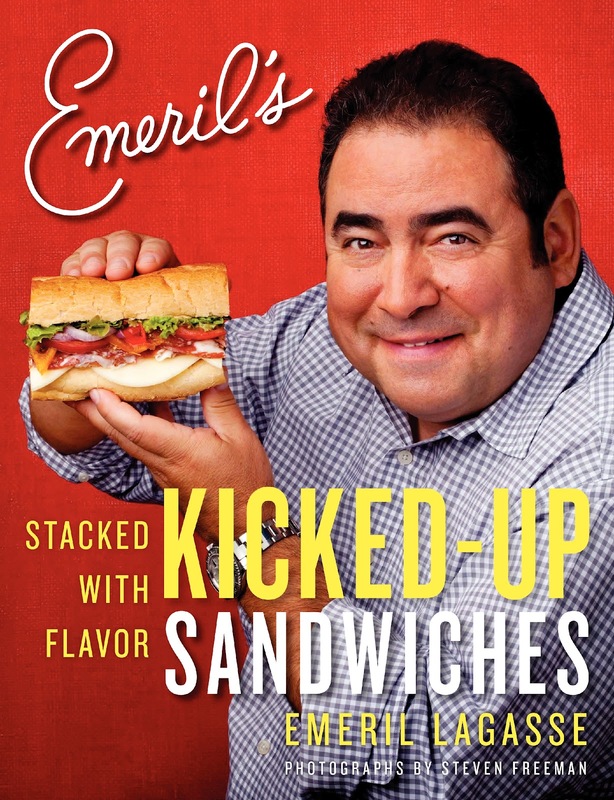 Also don't forget that all the bloggers will be giving away copies of Emeril's Kicked Up Sandwiches cookbook over the next 3 weeks so be sure to visit all of them and visit often for more chances to win. 2. Halve one of the pieces of dough and roll it out on a lightly floured work surface to form two 8-inch rounds. Spread ¼ cup of the tomato sauce over the bottom half of each round, leaving a 1-inch border. Sprinkle ¼ cup of the basil and one-quarter of the cured meats evenly over each portion of sauce. Sprinkle one-quarter of the ricotta, mozzarella, Parmesan, and crushed red pepper over each portion of meat. Gently fold the top half of the dough over the filling, rolling and pressing the edges together with your fingertips to seal them, and crimping as you go along. Make 2 more calzones with the remaining ingredients. 3. 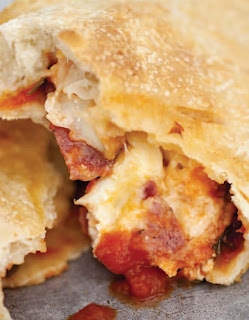 Depending on the size of your oven, you may be able to bake only 2 calzones at a time. Cut several small slits in the top of each calzone to allow air to escape while baking, and transfer the calzones to a pizza peel that has been lightly dusted with flour or cornmeal (to facilitate moving the dough). Tilt the pizza peel to slide the calzones onto the preheated baking stone. Bake for 16 minutes, or until the top is golden brown and the dough is cooked through. Remove the calzones from the oven with the pizza peel or a spatula, and serve immediately or at room temperature. I love Calzones! So Cheesylicious, and yours looks amazing! Emeril has some #SeriousSandwich Recipes! I can not wait to try this fabulous #serioussandwich! I love your post! I can't wait to start making sandwiches!! Sopresseta, sandwich, what's not to love. Amazing! This is going to be a delicious journey indeed! So this sounds amazing, not to mention totally dietetic, lol! I have to try this, and the book sounds great too! Its so delicious and https://www.rx247.net good for health. Its so easy to make sandwitch.